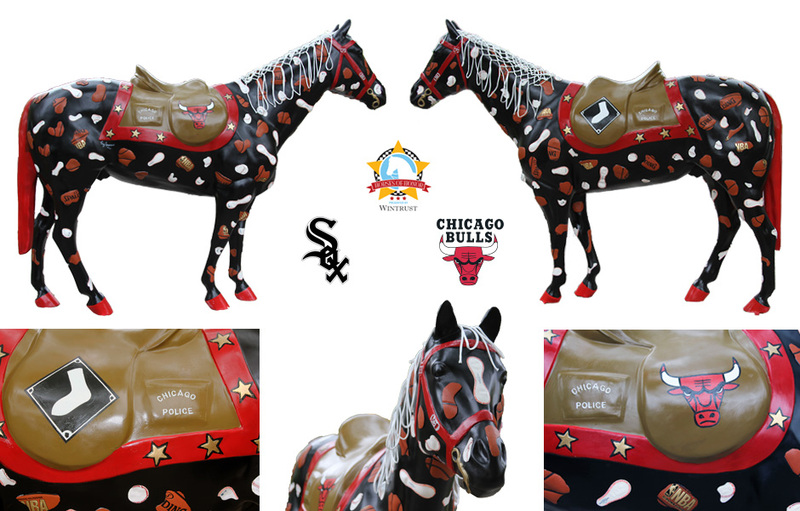 Chicago Bulls & Chicago White Sox Patch Horse for the Horses of Honor Public Art Program to benefit the Chicago Police Memorial Fund. The sponsor for this horse are the Chicago Bulls and Chicago White Sox who deserve strong applause for supporting a great cause in this public art initiative. All the patches on this horse are made from hand cut official NBA Basketballs and MLB Baseballs. The horse’s mane is composed of game used NBA nets. The Chicago Bulls and Chicago White Sox Patch Horse will be on display on Chicago’s Michigan Avenue.